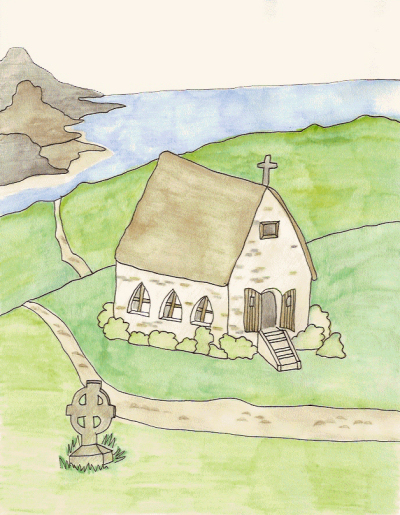 Far across the sea, on a small island carpeted with emerald green grass, stood a small church. Surrounding the old church were headstones and crosses of stone. Every Saturday night music flowed through the stained glass windows and blew in the wind across the isle. The four O'Reilly brothers had lovely voices. Their mum and dad brought them to practice with the church organ, small though it was. 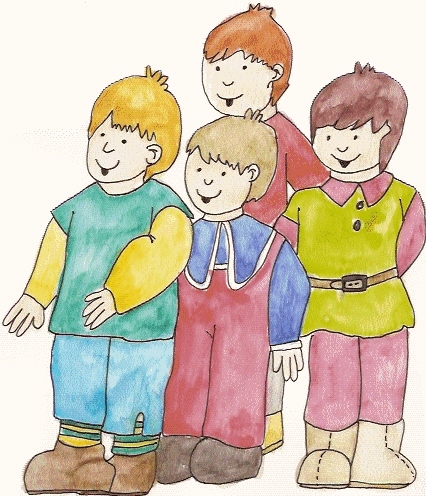 Kevin, Patrick, Seamus and Ryan didn't always want to come, but their mum and dad encouraged them. They didn't have a car, so they had to walk across the moor to the church. While they sat and waited for the boys to finish practicing, Mr. and Mrs. O'Reilly would go outside and watch the waves crash against the shore. Sometimes they gathered seashells for the boys, or picked up pieces of driftwood that was carried in with the tide. Every Sunday morning the boys sang for the congregation. It made them feel happy inside when they saw all the smiles and twinkling eyes. One Saturday morning, Kevin woke up with a cold. He coughed and sneezed and didn't feel well. “Mum, if Kevin doesn't have to practice tonight, I don't want to either,” said Patrick. “Me either,” added Seamus and Ryan. “I don't want to, Dad.” Patrick folded his arms across his chest. “Very well, Patrick. Since you're not going to sing, then you've got plenty of time to go and weed the potatoes. Get to it, lad.” Dad pointed at the door. Seamus shook his head no. “Yes, Dad. I'll sing, but I can't sing alone.” Ryan hung his head. “I'll tell you what. Mum and I will sing with you,” Dad said. “You and Mum? You can't sing,” Ryan said. After they'd finished their jobs, Seamus and Patrick came inside. Mum and Dad were wearing coats. “Where are you going?” Patrick looked at his mum. “Ryan, your mum and I are going to the church to practice singing. Since you and Seamus won't sing without Kevin, then it's up to Mum and I to sing with Ryan.” Dad buttoned his coat. “That's funny, Dad. You and Mum can't sing,” Seamus said, giggling. “Yes we can.” Mum opened the door. “While we're gone I want you to clean the dishes and then sit and read your school books.” She shut the door behind them. The next day Kevin felt better and asked if he could go to church. Seamus and Patrick wanted to go too. They didn't want to have to stay home and do more work. The family crossed the moor. A mist floated a few inches above the ground, capturing the smell of the peat bog. The family hugged and then headed home. The next Saturday night when they went to the church to practice, the lads invited their mum and dad to stay. From then on the family sang together each and every Sunday.